Suspenders — also known as braces — are how men used to keep our pants up. This timeless piece of men’s fashion dates back at least as far as the 18th century when rudimentary suspenders in the form of ribbons were used to hold up French pantalon. In the 1820s, faced with a fashion for high-waisted trousers, British designer Albert Thurston created something much more like the suspenders we would recognize today. Modern suspenders attach to your pants with either clips or buttons (more on this distinction below! ), and cross your back in an ‘X’ or ‘Y’ shape for added support and stability. (You may also have seen H-shaped suspenders, but these tend to be built into overalls or similar uniform.) They also come in a variety of widths, from a fashionable half-inch to a more sturdy 2 inches for heavy-duty workwear. First, the very basics: to put on suspenders, first attach them to your pants, at least on the back. Then you can either attach them to the front as well before stepping into your pants; or slip the pants on, pull the suspenders over your shoulders and attach at the front. Adjust for a good fit: you’ll know right away if you’ve pulled them too tight. Number one: under no circumstances should you wear a belt with your suspenders. There’s even a whole metaphor about it — taking a ‘belt and suspenders’ approach means being over-cautious, even redundant. Neither of these are how you want to look! Besides which, you’ll create a weird-looking square in the middle of your outfit, and you risk looking like Bill Lumbergh from Office Space. It’s a fashion faux pas for a reason. Finally, there are a number of hotly debated points of style when it comes to suspenders: read on for some points of view, and choose wisely! Historically, suspenders were seen as a form of underwear, a little like garter belts are now: something slightly risqué and best kept under wraps. In fact, in the 1930s a Long Island town briefly banned men from wearing suspenders without a coat to cover them up — but this was overturned when the (presumably overheated) men complained. These days we’re naturally more easy-going when it comes to rules about what can and can’t be flaunted. You might think that — having gone to the effort of choosing a smart pair of suspenders — it would be a shame not to show them off. But if you really want to commit to an elegant, old-school look, you might consider restricting glimpses of your suspenders to the occasional sighting beneath your jacket. To help you decide what’s best for you and your wardrobe, we’ve presented below the arguments for each method. But first let’s take a look at one of the biggest sticking-points in this thorny debate: are buttoned suspenders the more traditional choice? Metal clasps for attaching suspenders to pants were invented in 1894. That’s right — during every period of fashion history you associate with suspenders (unless you’re thinking solely of the 18th-century ribbon-slung French pantalon), clip-ons were both widely available and popular. So if you’re looking for a reason to eschew clips in favor of buttons, “buttons are more traditional” just won’t hold up. Suspenders are widely available, and ‘fast fashion’ suspenders — likely to be less expensive and made from a lower-grade fabric — are almost certain to be clip-ons. It may sound snobby, but choosing buttons will help you stand out from the crowd. And once you’ve committed to pants with buttons at the waist, the range of suspenders available to you will be of far superior quality. 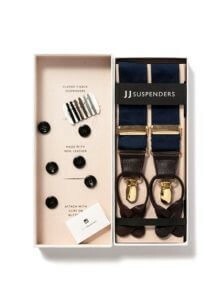 Many fashion writers compare the suspender issue to that of the bow tie: if you’re going to wear a clip-on, you might as well not have bothered. Whereas going to the additional expense and minor hassle of buying a proper bow tie and learning how to tie it — or, in this case, having buttons added to the waistband of your pants, selecting suspenders with button tabs, and then buttoning them up — shows that you care a great deal about what you wear, right down to the tiniest, button-sized feature. And for many men who care about fashion, that attention to detail is the very definition of style. Let’s not be too prescriptive here: it’s your look, so you can make the rules. If fun and tacky is what you’re going for; or if you’re embracing a dorky Urkel vibe; or even if you’re really committing to a vintage look by wearing suspenders the way most men in the 40s actually would have done: then clip-ons might work better for you. When it comes to style the most important thing is to dress deliberately — so as long as you know what you’re doing, you can do what you want. 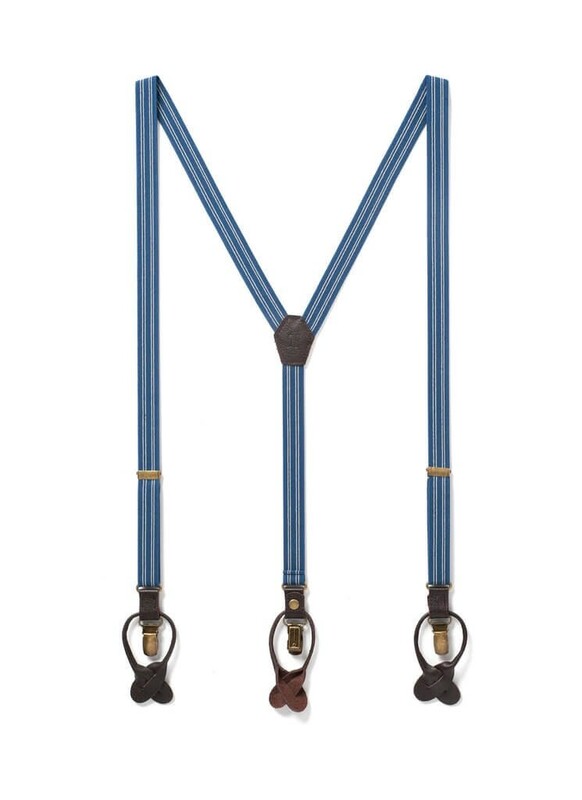 Whether your suspenders are buttoned or clipped; with loops or none; coyly covered-up or boldly flaunted; whether the look you’re going for is more Gatsby or Wall Street — suspenders have your back. Ditch the belt and give them a try today. Originally published at The Aspiring Gentleman.